EDISON, NJ — Headquartered in Anaheim, CA, Eleganza Tiles, Inc. a leading distributor of ceramic and porcelain tiles in North America, recently opened a fourth location in Edison, NJ. The company, which was founded by owner Mike Darmawan in 2002, also has facilities in Chicago, IL, and Dallas, TX. The 60,000-square-foot facility in New Jersey features an elegant 5,000-square-foot showroom, while the rest is warehouse space. The company’s extensive product line ranges from residential to commercial use and offers a wide array of possibilities that help homeowners, designers, architects and builders alike bring their ideas to life. 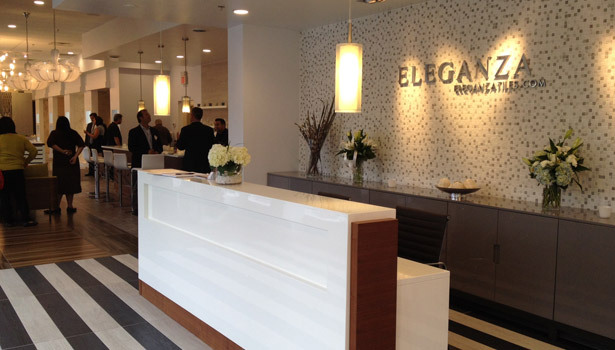 In celebration of its new showroom, Eleganza held a Grand Opening in early October. Guests were treated to food and drinks while they toured the stunning collections of porcelain and ceramic tile. According to Lee Hojin, Product & Marketing Director for Eleganza, the company intends to continue its path of expansion in coming years. “We are looking to expand three locations a year,” he said, adding that the Chicago location is currently going through a major renovation.